Okay, here’s an admission on my part. I freaking love the Dragonstalker’s Breastplate. Have you seen the full set? It’s what in the fashion world is generally described as completely bananas. That’s right, the same tier that gave us Judgement awarded hunters the chance to dress as giant, spiky, purple butterflies. It’s loud, it’s obnoxious, and, compared to the usual dull Hunter palettes of greens, browns, maroons, and greys, it’s actually kind of refreshing. Not that I’d ever wear the whole set at once, god no. Look, I’ll admit, sometimes I may skirt the edge of good taste, but there’s a line between “irreverent” and “clown college” and this sucker is 100% Grade-A clown college. 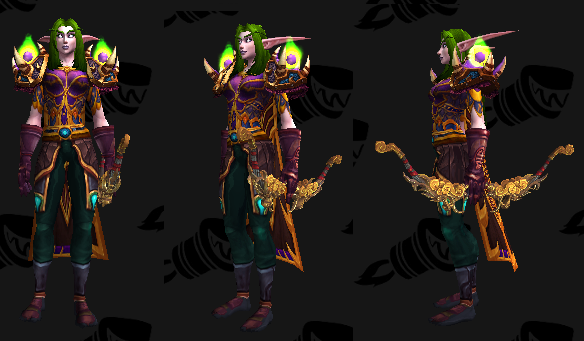 Still, I appreciate the vibrant colour and the butterfly shape in the chestpiece, so I decided to put together a toned-down mail transmog set for hunters looking for something a little different. It’s still bright, it’s still a little ridiculous, but if you’re looking to capture that old school Vanilla feel without making your eyes bleed, it’s worth a try. This entry was posted in Hunters, Mail, Purple and tagged gold accents, hunters only by Cathedral. Bookmark the permalink.